Preheat the oven to 350 F and line 2 muffin tins with large cupcake liners. Beat the butter and sugar until well combined. Add the eggs one at a time, beating well after each addition. In a separate bowl, sift the flour, baking powder and salt. Stir the milk and vanilla together. Add the flour and the milk alternately to the butter mixture, starting and ending with the flour and beating well after each addition. Spoon the batter (using an ice cream scoop is best) into the cupcake cups so they are two thirds full and bake for about 18 minutes, until a tester inserted in the centre comes out clean. Cool the cupcakes in the tins. For the frosting, use a stand mixer fitted with the paddle attachment or electric beaters, beat the butter until it is fluffy. Add 2 cups of the icing sugar and first beat on low speed to incorporate, then increase the speed to high, until fluffy. Add the milk and vanilla and beat in. Add the remaining 2 cups of icing sugar and beat in, adding further up to 6 cups until a fluffy and spreadable consistency is achieved (the softness of your butter when you begin is the reason you may have to make this adjustment). Add a little colouring paste if you wish, or separate the white frosting into a few bowls and stir a different colour into each bowl. 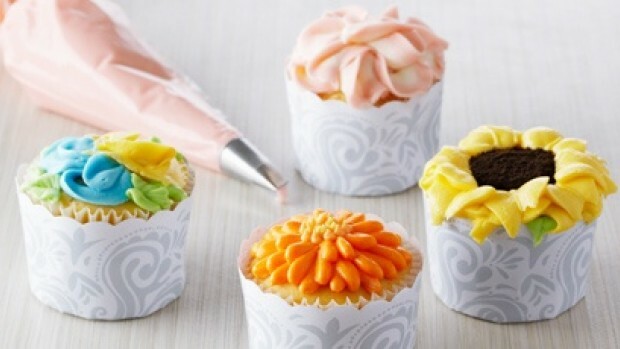 Begonia: Petal Tip #104; Suggested Colurs: Peach, Orange, Yellow, Red, White; With the wider part of the tip away from you, pipe 5 loops that cover the top of the cupcake, rotating the cupcake in your hand as you pipe. Fill in gaps with smaller loops. 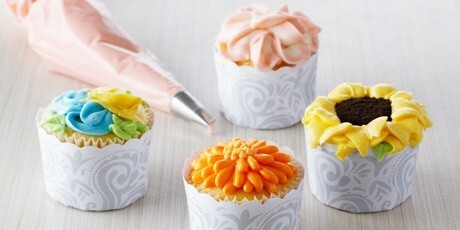 Add small dots of “pollen” using yellow frosting piped through a small plain tip #2 or #3. Pansy: Petal Tip #104; Suggested Colours: Yellow/Blue, Yellow/Violet, Pink/Violet, White/Violet, White/Yellow; With the Narrow part of the tip away from you, pipe large loops covering two-thirds of the cupcake. Using an alternate colour but same tip $104, pipe two small loops filling the remaining third of the cupcake top. Fill in the empty space of each loop with a smaller loop in the same or alternating colour. For added flare, use a small leaf tip #326 to add leaf accents. Gerbera: Petal Tip # 104; Suggested Colours: Pink, Peach, Orange, Yellow, White, Red; With the wider part of the tip facing upwards, pipe lines of frosting from the outer edge of the cupcake top in toward the centre. Layer these lines to build texture and dimension. Add small dots of “pollen” using yellow frosting piped through a small plain tip #2 or #3. Sunflower: Leaf Tip #113 for petals, plus chocolate cookie crumbs; Suggested Colours: Yellow for Petals, green for leave accents; First pipe a circle of frosting about an inch across in the centre of the cupcake. Dip this in cookie crumbs, tapping out any excess. Pipe yellow petals with the leaf tip starting towards the outside edge of the cupcake and layering in toward the dark centre. Use a small leaf tip #326 with green frosting to add a few green leaf accents.